Any Members looking for information about the Club such as competition rules , what the different sub-groups are about, what all those acronyms mean, can now find the Members handbook 15-16 MASTER under the ‘Important Documents’ in the ‘Documents’ tab . This is the same as the hard copy provided to new Members who attended the introductory meeting in September. Members who attended the AGM in May might remember that the Committee was asked to review the Annual Exhibition and as part of that process, we would like to have Members’ views on what they like best and anything they would like changed. To do that please find a questionnaire here Chichester Camera Club Exhibition Review which includes some background and the aims of the exhibition. Completed forms should be returned to the Club by Thursday 3rd December – or may be emailed to Lorna Brown. We all enjoyed the meeting with Mike Read and his catalogue of exceptional images of the unique species of birds and penguins on the Falklands Islands. The quality of the images was special due to the wild life that was unafraid of people and of the photographer’s experience as a freelance wildlife photographer and his incredible knowledge of all the names of the birds. Support our club at the SCPF PDI LEAGUE MATCH The PDIs first league match is at Bracknell on Monday 9th November. The judge is Jay Charnock FRPS. 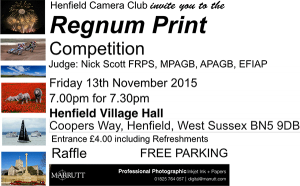 All of this information can be obtained from the Southern Counties Photographic Federation website. There are overnight carriage repairs planned for the A27 both east and west bound between Monday 9th November and Friday 13th November between Boxgrove and Crockerhill which will affect Club members going home after Tuesday’s Print Group and the Thursday Club Meeting as they come into effect from 8pm. You can find details of the diversions that will be in place on the WSCC website here and search for ‘Tangmere’ between those dates. There are also roadworks planned for Meadow Way (the road down from the Tangmere/ Boxgrove roundabout) the same week currently are not planned for Club nights. These are also listed on the County Council web. It’s Print Group on Tuesday 10th November and with the first Beginners and Intermediate Print Competition coming up soon, a good opportunity to bring along prints you are considering entering. Everyone is welcome, and all kinds of images – whether that first thoughts on new work, pieces in development or final prints you would like to show and discuss with others. Work doesn’t have to be mounted or full size, but attached to card helps keep prints upright for viewing. If you’d like to just come along to see what the group does you will also be very welcome. 7.30pm in the small hall at Tangmere Village Centre. In this demonstration Jeff will show you how to extract the best quality image out of your raw file. We will cover the workflow and some of the advanced tools available. All of your basic, single image adjustment work can be completed in Raw; Photoshop these days is only needed for more advanced work such as Layers for compositing and for advanced cloning. Let’s make this session very real and practicable trying to help you get the most out of your raw captures. If you have an image that is giving you a particular problem, one that is difficult or one you would just like processing suggestions on then please bring one Raw image along. Please bring your questions. This is a practical discussion and demonstration on how to go about planning and organising a creative photography outing. Starting with the research before a shoot, continuing on with the equipment and its use during the shoot. Then Jeff will look at how he sets about shooting images, the equipment he uses and how to use it. Next he will show some of his work with discussion and demonstrate how it was captured. What do you really need to use for a great image? Is it better to use filters or not? Do your images lack quality, sharpness or good colours; we will study and discuss good practical field craft for high quality photography. Your questions and participation will be warmly welcomed. Break out of your bounds and try some new techniques and equipment.